CollectPlus has over 6,000 stores throughout the UK and Northern Ireland. These could be your local Co-Op McColls, Budgens or Spar, as well as many independently owned convenience stores and newsagents and petrol stations. Unfortunately there are no collection points in the Channel Islands or at BFPO locations at the moment. 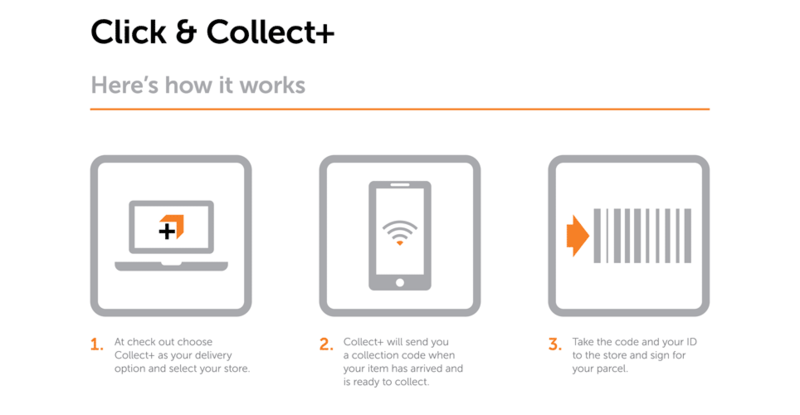 During checkout, when you select CollectPlus as your delivery method, you will also be able to select your nearest collection point using a postcode. Alternatively the CollectPlus website offers a postcode or location search. CollectPlus stores are open early ‘til late, 7 days a week. The opening times for your local store will be shown as you choose your preferred collection point when placing your order. Once you have successfully placed and paid for your order, your item(s) will be processed and shipped to your chosen collection point. You will receive confirmation from CollectPlus via email and or SMS once your parcel is available for collection. This will include your unique collection code. Your item(s) will normally arrive at the collection point within three working days of your order being processed. Parcels are delivered to CollectPlus collection points Monday to Saturday. A specific time for arrival cannot be given. 11. What should I do if I don’t receive my collection code from Collect+? 16. Once my order has left Little Mistress can I track it? If, your order has already been processed, then please do not collect the parcel from the CollectPlus collection point. Any uncollected orders will be returned to us after 10 days and a refund will be issued. You may still be charged for the CollectPlus delivery cost. If, when you pick up your parcel, you decide that you don’t want all or part of the order, or an incorrect item has been sent, please follow our normal returns process.